Wait, oops. Sorry about that. The song quote is my My Little Pony DVD review shtick, not my comic book review shtick. I got confused for a moment because, for this set, I decided to review three My Little Pony issues. That way, all you pony fans can get excited, while all you non-pony fans have one convenient place for all your one-stars! Everybody wins! Yay! Last issue ended with the reveal that the new Nightmare Moon is none other than Rarity, making her Nightmare Rarity, or I guess Nightmarity for short. Anyway, this puts a bit of a damper on the whole “rescue Rarity” plan the rest of the cast had. As Nightmare Rarity likes to gloat, they can’t use the Elements of Harmony when their element of Generosity has switched sides, so they are instantly captured by the Nightmare forces of the moon. Princess Luna escapes back to Ponyville, while Spike is pretty much ignored. 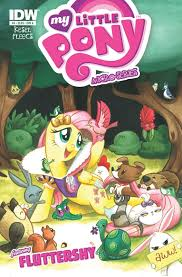 Spike then becomes the central character of this issue, as he tries to steal the key from the Nightmare forces to unlock the dungeon where the other five ponies are being kept. He is eventually caught by Nightmare Rarity, who uses her dream powers to create a dream world where Spike is king and she is queen. Spike figures out the ruse pretty quickly, but he’s no closer to saving anyone by the end of the issue. The design for the “new” character, Nightmare Rarity, is pretty good. I especially like the use of diamond shapes for her eyes; it’s perfectly in character for Rarity, but still manages to look evil. 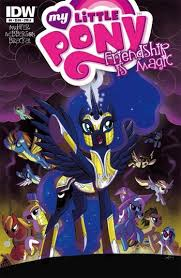 Heather Nuhfer and Amy Mebberson’s first arc comes to a much more satisfying end than that first arc; instead of a ridiculous one-on-one fight to the death between a purple unicorn and a bug, this arc features our heroes fighting the evil of unfriendliness with the magic of friendship. Kind of like what the title promised. This feels more like an episode of the show; yes, there’s a big battle, but at the end of the day, no one really gets hurt, and even the bad guys leave unscathed and in a better place than when they started. The ponies fight by convincing bad guys to not be bad guys, or encouraging their friends to not be afraid. Okay, there are also a couple of slapstick fights between the background ponies of Ponyville and grey clouds, but it’s all in good fun. Though, annoying continuity police moment here, a few of the ponies seen don’t actually live in Ponyville; I guess Babs Seed was visiting Apple Bloom for the weekend? This arc wasn’t as funny as the first one, however – and this is, after all, a funny animal comic. So, some nitpicky little continuity stuff and could’ve been funnier; still, much better than the first arc. To round up this criticism of My Little Pony, we get a story where the moral is screw critics; they don’t matter at all. Well, thanks, My Little Pony. I am of no consequence, never mind me. 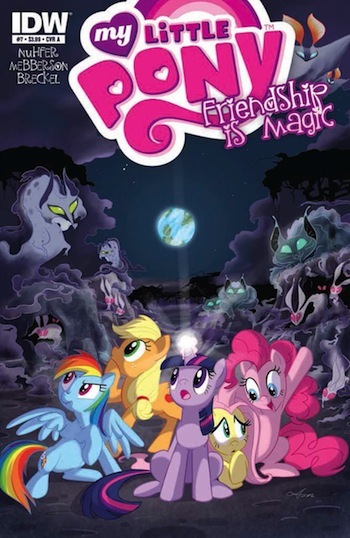 Perhaps fittingly for a comic about knitting as art, the art for this issue (by frequent MLP cover artist Tony Fleecs) is fairly simple; the backgrounds aren’t as full of detail as most other issues. The art does resemble the show rather more than most other issues, as show-like soft colored lines are used on the characters instead of hard black lines.